Flo's level of vigilance can be customized while it monitors household water usage. The feature includes three main settings: Home mode, Away mode, and Sleep mode. With each new product category that hits the smart home scene, there’s a new skill set to learn, new vernacular to master, new customer expectations to meet. Take motorized shading. Requiring more than just integration skills, motorized shading forced dealers into a world of fabric colors, textures, weights, and opacity. Networking: A similar situation unfolded, with dealers branching into the world of IT. Based on the number of smart water valve controllers showcased at CEDIA Expo 2018, plumbing appears to be the next skill set for dealers to acquire. Or is it? At least three different manufacturers at the CEDIA Expo showcased water leak mitigation solutions that seem like they should be installed by a certified plumber, but have been designed for installation by complete plumbing novices. In fact, these devices are so simple to install—requiring no cutting of water pipes--most were initially promoted as a project handled easily by DIYers, and selling for an affordable $200-$400. DIY Products Become Profitable for Pros? These solutions are still widely available at consumer outlets like Amazon and Home Depot, but as is the case with other types of DIY products, many consumers would still rather have a pro handle the installation and setup. 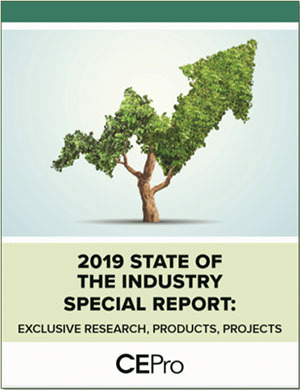 It’s the reason these manufacturers are now developing special programs for not just plumbers but also home systems professionals, integrating with popular third-party products and control systems, and exhibiting at trade shows like the CEDIA Expo. Smart Plumbing: The Next Big Thing? 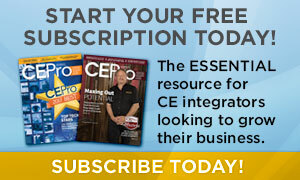 So why should you care about smart plumbing products? Sure, you’ll probably need to install a lot of them to make it worthwhile, but they’re an easy sell. The stats alone are enough to convince any client to invest in a device that will protect their homes from costly water damage. According to industry estimates, more than 14,000 water damage claims are filed with insurance providers each day the U.S., with the cost of restoration averaging $12,000. Statistics in the US show that one out of every ten homeowners will have a major water damage event at least once every 10 years. Even the tiniest of leaks in a water line can do serious damage. A 1/8-inch crack in a pipe can spill 250 gallons of water in a day. The way in which the Flo water valve controller detects leaks is unique and innovative. It continually monitors the water pressure; when that pressure changes, it could be a sign of trouble, like a small leak—even one as small as a drop of water per minute. Your customers would likely never know a leak like this existed until months later when they actually see the damage. 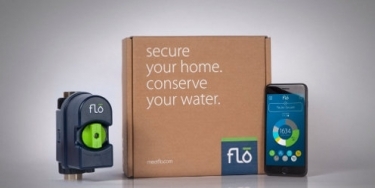 Other sensors integrated into Flo monitor the temperature and flow of the water. Along with the water pressure sensor, the trio can detect the possible onset of freezing pipes. When an issue is detected, Flo sends an alert to a customer’s smartphone. From there, the customer can shut off the valve remotely or let Flo turn itself off automatically. Also from this remote app, customers can view their water consumption habits. The data is broken down by individual appliance so they can see exactly which shower, toilet, or faucet is using the most water. Home mode is for normal or day-to-day use. Home Mode activates the regular protection expected from the Flo System. Away mode is for when you’re away from the home for an extended period of time, like on vacation. Because the system knows no one is home, it will take quicker action to protect the home if it detects any abnormal events. Sleep mode is for when you’re intentionally using an abnormal amount of water (e.g. filling a pool, etc.). This mode ignores all proactive and real-time tests, parameters, and quiets all alarm notifications, effectively putting Flo to sleep. Sleep mode should only be used when irregular water use is planned. One more perk: Flo Technologies offers customers a reimbursement program called HomeProtect. For $5 a month, program will reimburse homeowners for their insurance deductibles, up to $2,500 if their Flo-equipped home suffers major water damage. 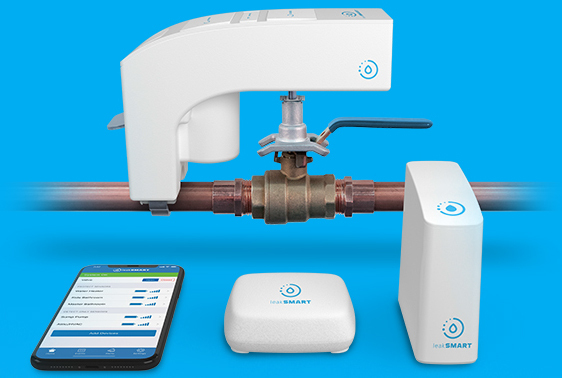 The LeakSmart Snap smart water controller snaps onto a home’s main water line. It, along with various other sensors, communicates with a Wi-Fi hub. The hub features Zigbee 3.0 protocol to ensure that the hub works and sends notifications to a user’s LeakSmart smartphone app, even in a power outage. The app enables a user to turn on and off the main water line in a home remotely. But where LeakSmart really stands apart is in its degree of integration. Should a Nest thermostat detect a drop in temperature, for example, it can signal the LeakSmart to turn off the water line to prevent freezing pipes from bursting. When a leak sensor detects water by the washing machine, for example, it signals the valve to turn off a home’s main water line.Yes, there’s a water valve controller that attaches to the main water line and it does the standard stuff, but Guardian also comprises many other sensors to form a complete system that is able to communicate via a Z-Wave bridge. Other sensors in the Guardian lineup include door/window sensor, motion detector, and a smart electrical plug. There’s also a battery backup device that keeps the valve controller working in a power outage.